The Sheep Whisperer: Promising for Sheep? -Take 3! Promising for Sheep? -Take 3! Shepherd will lead to even further blessings for the sheep. They say I'm a little rebellious & need Restoration! What do EWE think? Who's leading us? Are Ewe sure the Shepherd knows about this? 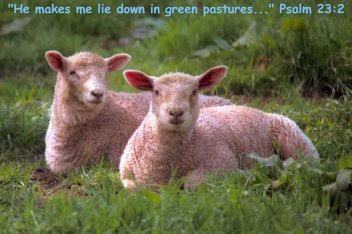 David continues the Psalm by stating another key responsibility of the Shepherd, the role of restoring the sheep.﻿﻿Sheep can easily find themselves in life & death situations, particularly if they are "cast down". A "cast down" sheep is an old English shepherd's term for a sheep that has literally been turned over on its back & unable to get up. 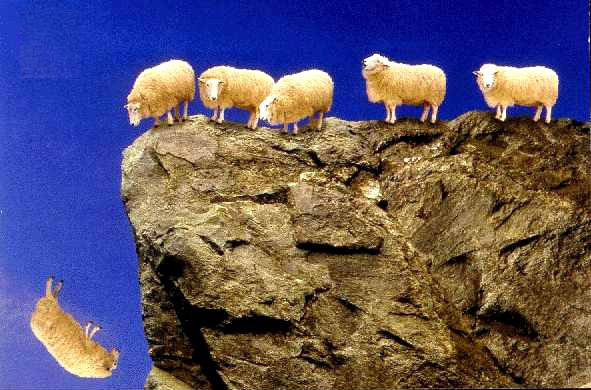 "Cast" sheep are absolutely helpless,﻿﻿ & will eventually die, unless the Shepherd arrives﻿﻿﻿﻿ in a timely fashion. Shepherds must be on the alert for missing sheep, their vulnerability to predators, & their critical need for rapid restoration. Bleat! Bleat! Bleat! "I'm Falling & I Can't Get UP!" 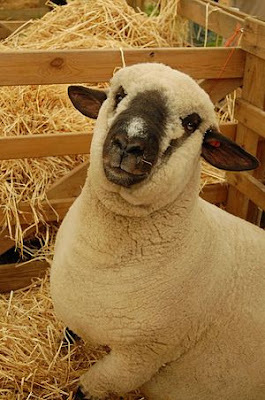 Don't EWE worry about a thing. 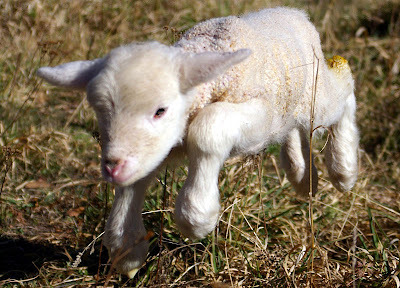 I'll carry EWE the rest of the way! 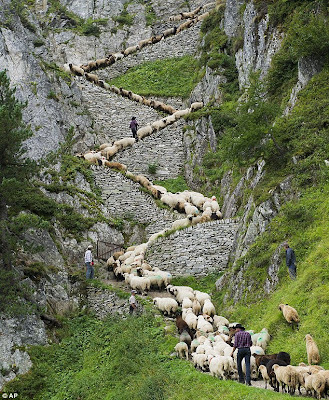 David now confirms in the Psalm, that sheep need to be led into the "right" paths by the wise Shepherd. Characteristically, sheep are "creatures of habit", finding themselves walking on the same paths, & grazing in the same pastures until they are moved. As a result of their "bad" habits, ruts & gullies are formed, & pastures are turned into literal wastelands. Thankfully, the wise Shepherd is intimately acquainted with the sheep, & knows that managing the land & the sheep properly, will involve keeping the sheep "on the move"! Healthy sheep must be led into new paths & new pasture lands, thus preserving the health of both the sheep & the land. This is the scene that David, as a Shepherd, is personally acquainted with, & is vividly painting for us in the 23rd Psalm. "True leadership must be for the benefit of the followers, not to enrich the leader." I can't wait to get to the new pasture. ARE WE THERE YET? 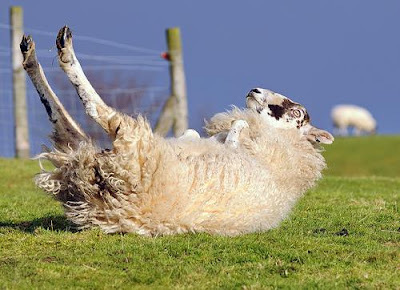 Life is Good here, but don't Ewe get too "Comfy"! We're about to be MOVED! Sheep are in need of more management & guidance than any other domesticated livestock. The Good Shepherd is aware of their needs & keenly leads them accordingly! I just follow the Shepherd cause He knows what's best! Ewe know I'd be "Lost" without a Shepherd! As Ewe graze on the paths that Ewer Shepherd leads Ewe into today, rejoice that He is leading Ewe into lush pastures that will truly satisfy Ewer appetite! "I am come that they might have life, & that they might have it more abundantly." Good take on the 23rd Psalm. That is one of my favorite verses. Thanks for commenting Anonymous, & for the kind words of encouragement! It's a "rich" Psalm, full of numerous "tasty" nuggets of Truth. I hope that the Spirit continues to minister to Ewe through His awesome WORD! God Bless EWE Anonymous! Great Stuff..!!!! 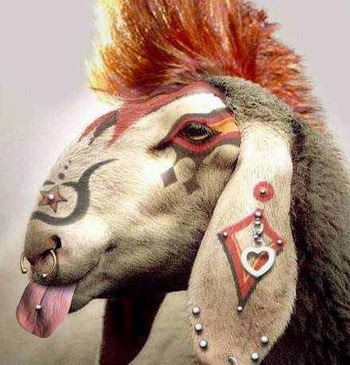 I think that rebellious sheep needs some counseling! Ewe can say that again J woods! Only the Good Shepherd can discipline some sheep! Thanks for commenting & for the encouraging words! God Bless Ewe!